One of the huge shifts in modern society is the rise in eating alone, accounting for around 50% of all adult eating occasions. The culture of eating alone however has not been developed. We often go to great lengths to distract ourselves and pretend it isn’t happening. This project aims to create space in peoples life for positive experiences of eating alone. 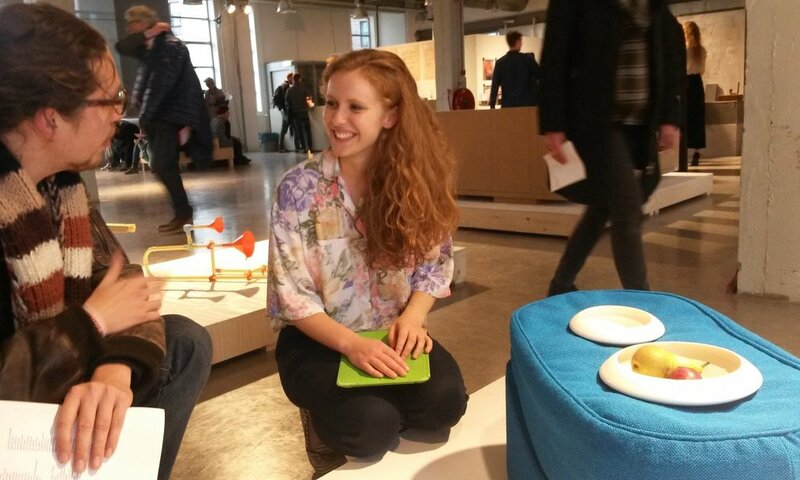 The furniture suggests physically new ways of eating to help people break away from unsatisfying routines. By being specifically designed for eating alone, it also helps people realise it’s a normal part of society and nothing to be ashamed of. Nessle and it's twin Incline become the props by which you can develop your own habits of solitary dining. The best way to eat is fully concentrating on your food, but with eating alone, that silence can seem almost terrifyingly boring. To allow myself to get over the fear of eating alone without distractions, I began to eat in different places around the house to make it feel like an adventure. It worked and I really enjoyed eating in the bath, under the table and looking out of the window, with no distractions. These positions quickly become uncomfortable however so I set about designing the furniture which would enable me to keep my explorative habits, but do so in comfort. I worked iteratively, letting experiments turn into ideas and sketches into physical tests. I tested all the prototypes on myself, regularly eating in unusual positions and assessing what changes would improve them. Every shape and line is based on that. This shape came out of the desire to have a stable base for eating on your lap. The top surface is filled with cherry stones so it can mound itself around your cups and bowls. The ceramic bowls themselves have conically bottoms so they can be gripped more firmly and curve inward at the top. 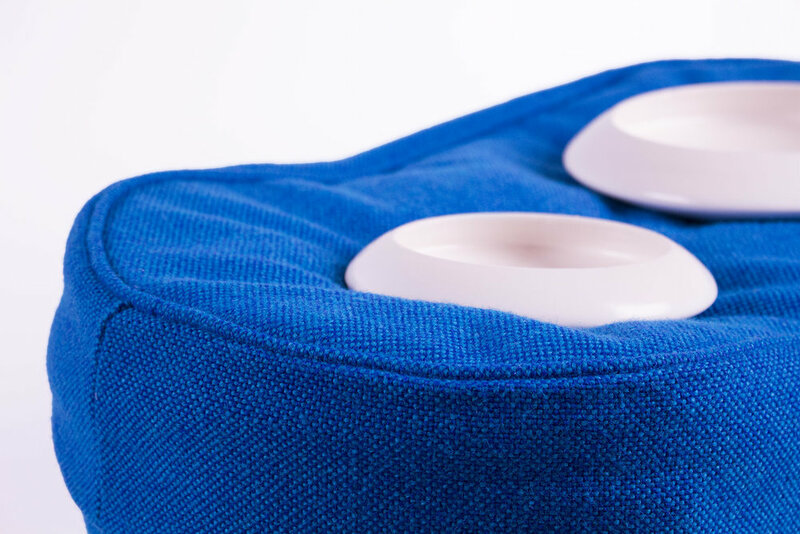 When the top cushion is slid from it's complimentary base onto your lap, no food will spill. 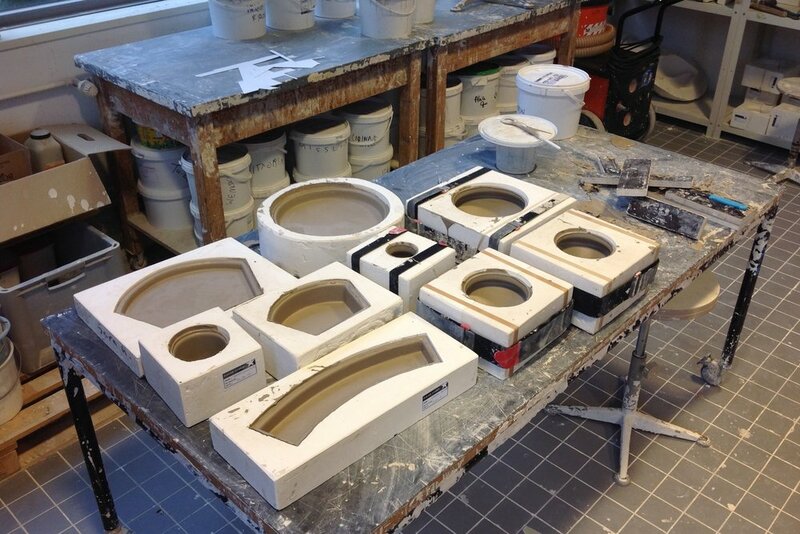 Graduation was an excellent opportunity to take our products to the next level and produce professional prototypes. I worked with Studio Stelt in Den Bosch to upholster the final design and the fabric was sponsored by Kvadrat giving Nessle and very luxurious look and feel. The cups and bowls were made from ceramic so they had the sense of luxury that comes from that traditional material. I wanted people to connect with the traditional sense of occasion people have when eating, adding it to the new culture of eating alone. I produced them using the slip cast method, first creating a foam shape of the positive form, casting it in plaster and then pouring liquid (slip) clay into the plaster mould. Nessle with exhibited alongside Incline at the Design Academy Graduation Show October 2015 where over 30,000 visited. I had the chance to talk with hundreds of interested people who often shared their own touching experiences of eating alone.